James' Empty Blog: Global warming abolished! When I was a kid, there was an evil empire that practiced selective acknowledgement of reality to justify its peculiar ideology. That country was not the united states. Thanks God, at least Karl Rove is still reasonable in contrast with the global warming lunatics. If you want to know what this whole global warming hysteria was all about before it was abolished, go to motls.blogspot.com and search (box in the sidebar) for global warming. Great Find! I just diaried it on Daily Kos. Anyone get any screen shots? So are we taking bets on when the Congressional Investigations will be held? The latest sentiment over on dKos is that it's a technical/design issue related to search-by-tag/category, vs. the fulltext indexing we know and love in GoogleWorld. Also, it appears to be case-sensitive. Luvverly! We can remove the tinfoil hats, a typical conspiracy may not be necessary to explain the observed behavior. The alternative pay-for-play "theories" explaining observed global climate crisis effects, however, is another story. Perhaps Google will fix their search algorithm soon to rectify this obvious problem. When you invoke the given address you might notice that there are http-encoded blanks in the search (see them in the URL in your browser as "%22". Remove both of them, and you'll get more than 4,000 hits. I think you're missing the point. 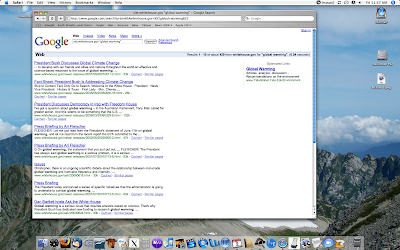 As you have found, the words "global" and "warming" both search ok, as do all other words and phrases I have tried. It is the precise phrase "global warming" that suspiciously finds only one document via their search engine, but 400+ through google. I find it hard to avoid the conclusion that this is a deliberate act since all other searches work fine. If anyone disagrees, can they find any other search at all where the whitehouse.gov search result differs so strikingly from google? This could just be a case of poor exact phrase indexing. "Global Warming" (just capitalise the first letters) returns over a hundred documents, and preceding each term with "+" in a non-exact match reveals even more, with the highest ranked actually being relevant. If this is a case of censorship, they have done a very poor job of it. One needs to remember the lesson of Mike McIntee when he too was over-eager to expose censorship at the Whitehouse website. Turned out that the mysterious black bars were easily explained away as some kind of RealPlayer feature. You don't want to give to those who deny human-caused global warming any more ammunition regarding your bias towards alarmism and persecution paranioa. Try "faith based". The crappy Whitehouse search engine returns only 2 documents (plus a pointer to a special faith based webpage) and yet the equivalent Google query yields over 6,000 references. "Don't worry about missing a document because it doesn't have one of the words in your search -- your search returns relevant results even if they don't contain all query terms." Also, whitehouse.gov search finds "bang my head" and not "global warming" in Tony Snow's January 18 press briefing. So, they have tagged "bang my head" and not "global warming"? I don't think so. I will correct matters at kos tomorrow or whenever my account is activated. What's with this darn waiting period at koz??? It is easy to find similar tagging errors that have little to do with climate change. Exact string match on "no child" returns many documents on Bush's "No Child Left Behind" initiative, yet "child left" and "left behind" both return zero entries. All we can conclude is that they have a stupid string matching algorithm for indexing. No ulterior motive is necessary when incompetence is sufficient explanation. "global warming" is not tagged. The first one gets a hit on this page and the others do not. Do I understand you correctly? Is this the claim of the tagging theory? Does this pattern of tagging seem to be even remotely plausible? "Hurricane theory does predict that global warming will cause hurricanes to become stronger"
Now, it is possible that they tagged only "predict that global" and "will cause hurricanes" but it is not plausible. 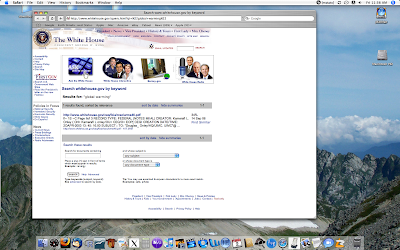 whitehouse.gov was found to be blocking "iraq" from crawlers back in 2003 in some directories. They claimed it was just a mistake made while trying to eliminate duplicate hits. Pretty good summary of the incident at deadparrots. There must be some special trick to doing a link on this blog. Or maybe I botched it. I am a blogger newbie (as if you can't tell). Evergreen tells stundents to search whitehouse.gov (among other sites) using "global warming". Of course, we know it won't work. PS: got the tag right. you have to avoid skipping a line after href I think. Evergreen tells stundents to search whitehouse.gov (amongother sites) using "global warming". Way back when I was in college, National Geographic published a full issue dedicated to global cooling. November 1976. I like the historical graphs of global temperature. Someone ought to correlate the "cooling" I experienced as a child with atmospheric testing of nuclear weapons. All those tons of dust!!! More dust than Krakatoa!!! If you must know, I prefer warming. And I think it will be easy to stop the warming with a H-bomb air burst or two. Hell we evacuated and burned Atlanta, why not evacuate and burn Baghdad. The blog consensus on this seems to be that whitehouse.gov has a crappy search engine, since some buzz wordslike "no child left behind" and "faith based" don't get hits either. But, this is a very vague explanation. Could be they are controlling certain buzz words. are encouraged to go to a specific link that gives the White House line. So the text search does not work, but the search engine is aware of the terms and directs you to a particular web site? Odd.